India's Mahatma Gandhi once said, "You must be the change you wish to see in the world." And that, says Shi Yan, is the inspiration behind the 5.3-hectare Dondon Farm in Beijing's northwest - China's first Community Supported Agriculture (CSA) farm. Shi, pursuing her doctorate studies at the School of Agriculture Economics and Rural Development, Renmin University of China, traces the beginnings of the CSA story to her half-year stint as a farmer in the United States. 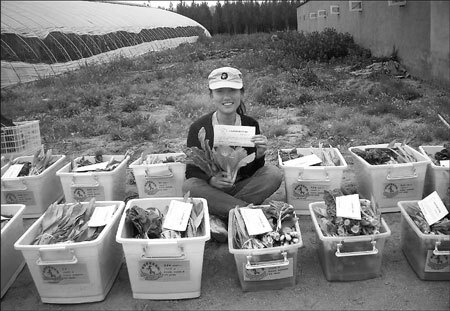 In April last year, on the advice of her research advisor and with the help of the Institute for Agriculture and Trade Policy, Shi took up the opportunity to work as an intern on the Earthrise Farm in Minnesota to learn how a CSA farm is operated. An urban girl from a well-off family in Hebei province, Shi calls her experience as one of a "foreigner sent to the countryside," a reference to the "reeducation" of youth during the "cultural revolution" (1966-76). "I chose to study agricultural economics and rural development because I wanted to do something substantial and down-to-earth," Shi says, "but I had neither lived in the countryside nor had I done any farming". In the beginning, Shi was indeed a little hesitant, especially when she learned a team of five would have to manage all the work on the 5.3 hectares of land. But the moment she landed at the farm in Minnesota on April 18 last year, Shi made a promise to herself. "From now on, I will discard my petty-bourgeois lifestyle and prepare to get my hands dirty."